Tonight I made my first green smoothie. I tossed in a few handfuls of spinach, some orange slices and a bit of frozen pineapple in the blender. The result wasn’t too bad and something I could probably drink on a regular basis. No bitter spinach taste came through, but it definitely wasn’t as sweet as my normal fruit smoothies. 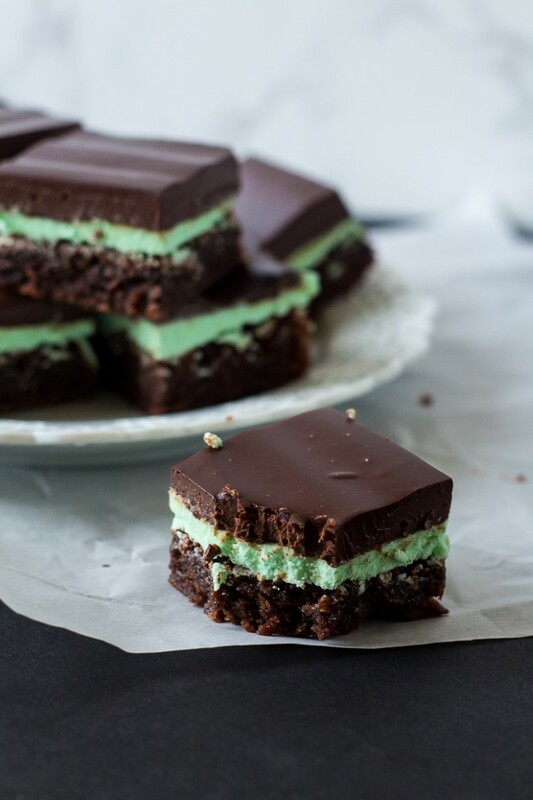 I’m trying to convince myself that all the nutrients are worth it, but my idea of something green and delicious is these Mint Brownies with Chocolate Ganache. These brownies are a bit of work with three layers, but every layer is worth making from scratch. The brownies barely take longer than a box mix, just whisk everything together in one bowl. Pour into a pan and bake. The recipe is my go-to brownie recipe with a bit of mint extract in it. Feel free to use your favorite kind of mint extract. 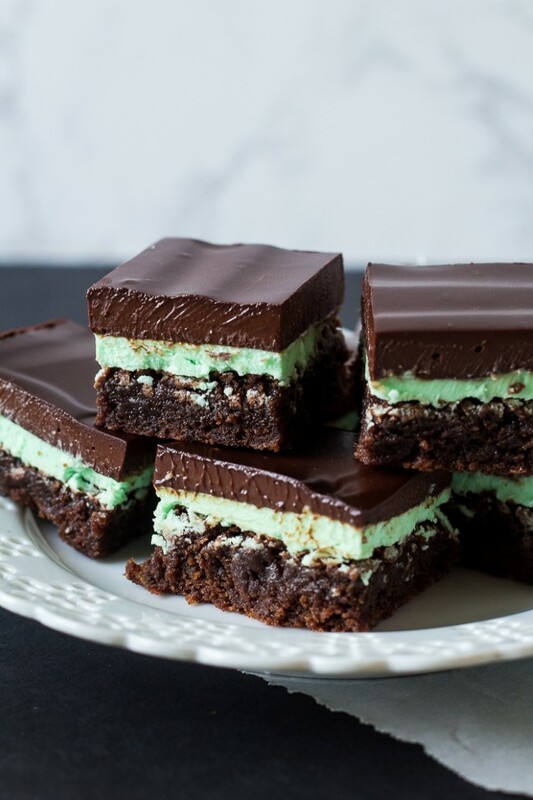 I’ve used both spearmint and peppermint extract in these brownies. 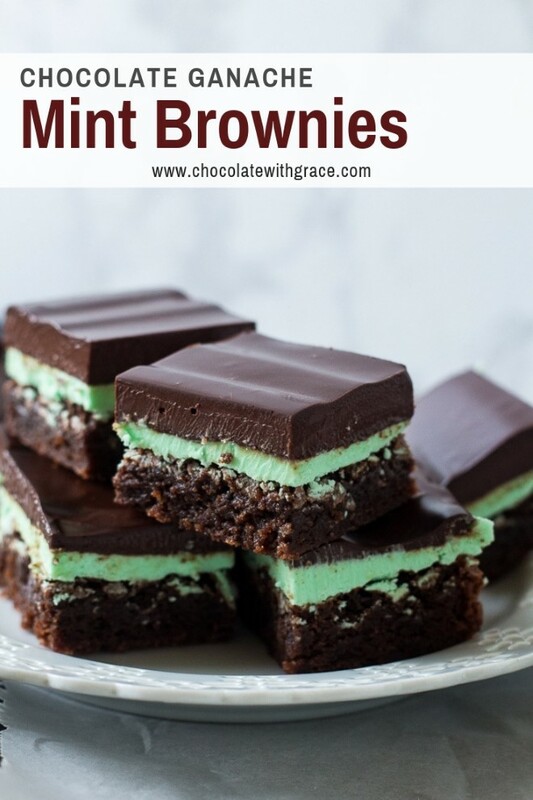 Make the brownies and then while they are cooling, make the green mint icing for the brownies. It is simply butter, powdered sugar, milk, mint extract and a few drops of green food coloring. Beat it together with a hand mixer until smooth and creamy. You could also color the frosting pink if you wanted pink peppermint brownies. They would be fun for Christmas or Valentines day. The last layer is the chocolate ganache. It’s easier than the frosting layer. You simply chop up your chocolate and then pour hot cream over the chocolate and whisk until smooth. If you’ve never made it before, I recommend checking out this post on how to make ganache from Natasha’s Kitchen. It has a ton of tips and tricks for first timers and although we aren’t icing a cake, the principles are similar. Once you have ganache mastered, you will be using it on everything, it’s that good. I use 72% bittersweet chocolate for my brownies. 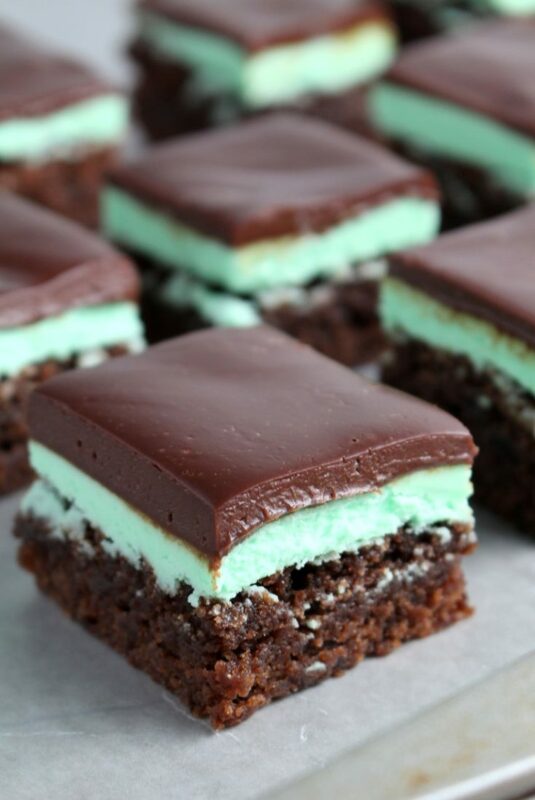 The dark, dark chocolate layer is a great compliment to the sweet mint buttercream. Since these brownies are topped with ganache, they should be stored in the refrigerator. Cover tightly and store in the refrigerator for 3 days. If you want to make them farther in advance, they freeze well. Simply bake and cool, then cut into bars and put them in a tightly covered container, they will freeze well for at least a month. I get asked frequently how to cut these brownies into such neat squares. Here are my tips. Line your pan with parchment paper and let the paper hang over the sides of the pan. Then, when the brownies are ready to be sliced, you can lift them out of the pan with the parchment paper and set on a cutting board. This will help. Use a large knife. I use my large chef’s knife to slice them. The less you drag the knife through the brownies, the cleaner the cuts will be. Wash your knife between every slice. Yes, it is time consuming, but it will help get those picture perfect lines. You don’t want to smear the ganache into the mint buttercream. Just know every slice won’t be picture perfect. I took pictures of the best 6. The other are still pretty and edible, they just aren’t as perfect. This brownie recipe is adapted from my Best Brownie Recipe in the World From Scratch. If you’re looking for a great fudgy brownie recipe, be sure to check it out. To make the brownies, preheat oven to 350 F. Grease and flour a 9 x 13 inch pan or line with parchment paper. Melt the butter in a large microwave safe bowl. Whisk in the oil, sugar, eggs, vanilla and mint extracts. Beat in the cocoa, flour, salt and baking powder. Spread in the prepared pan and bake for 22-25 minutes or until an inserted toothpick comes out with a few crumbs. Let cool completely. To make the mint buttercream layer, beat the butter in a stand mixer for 1-2 minutes, beat in the powdered sugar. Add enough of the milk or cream to be a spreadable consistency and the mint extract to your tastes. Spread on top of cooled brownies and refrigerate. For the chocolate ganache, finely chop the chocolate and place in a heat proof bowl. In a heavy saucepan, bring the heavy cream to a simmer. Do not let it boil. Pour the whipping cream over the chopped chocolate and whisk until smooth. Pour the ganache over the mint layer and refrigerate until set. Cut into squares. To satisfy your mint craving, check out these other fun treats. This Chocolate Mint Brownie Milkshake sound perfect for the hot summer day I’m dreaming about. If you need a chocolate mint fix in a hurry, try these easy Mint Chocolate No-Bake Cookies from The Recipe Rebel. 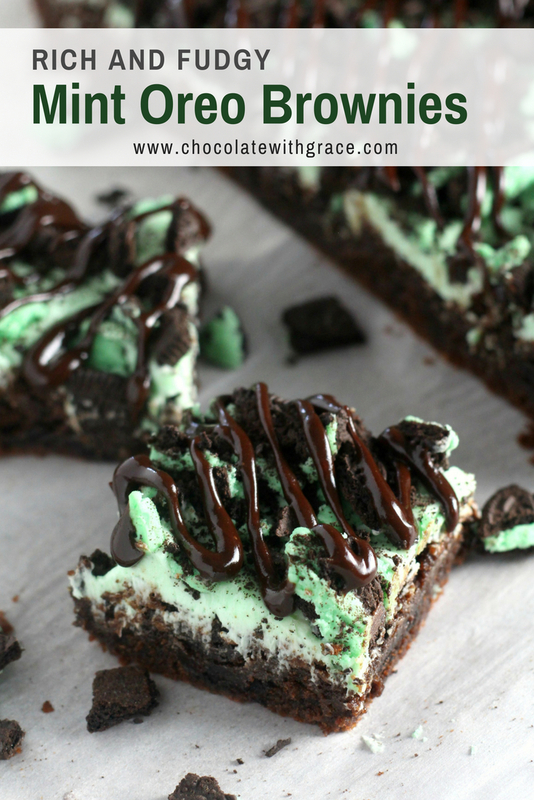 And if you if neither of these options suit your fancy, check out this collection of 80+ Chocolate Mint Desserts by Crazy for Crust. 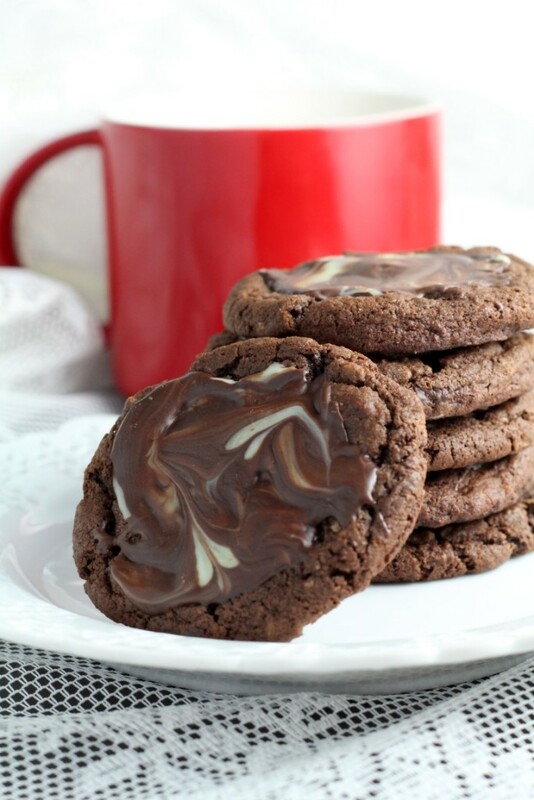 If you’re more of a cookie person try these Andes Mint Cookies! These look amazing! And perfect for St. Patrick’s Day. I love layered brownies. Pinned! These brownies are incredible, Mallory! I love mint and chocolate. The layers look perfect! How did you know I’ve been craving homemade brownies? I need these in my life stat! there is nothing like chocolate and mint!! Just wonderful!! These are gorgeous. 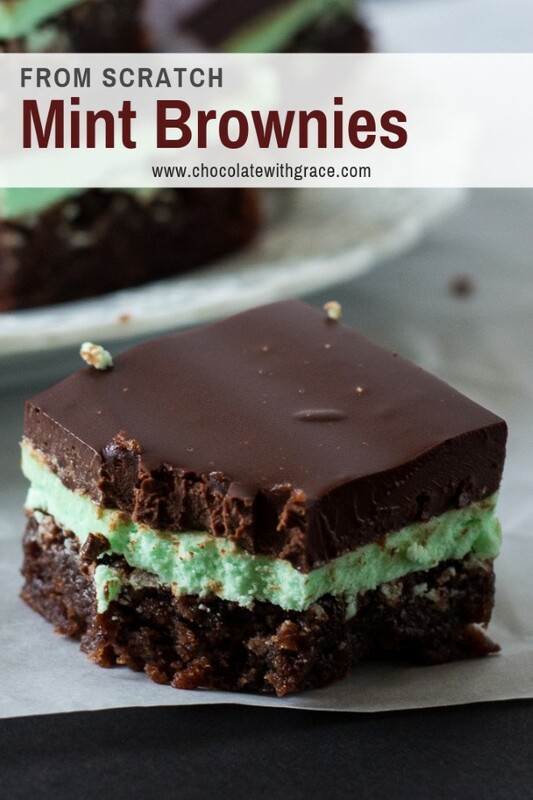 Chocolate and mint are perfect together especially in brownies! 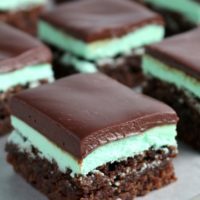 Mint and chocolate is one of my favorite combinations! Wowie! I’m smitten with these gorgeous brownies. And that mint layer! Perfection! Wow, these are gorgeous!! Yum! Chocolate and mint is definitely how I prefer to eat my greens! These look amazing! These brownies look AMAZING! I wish I had one right now! I’m sure that would work, Diane. 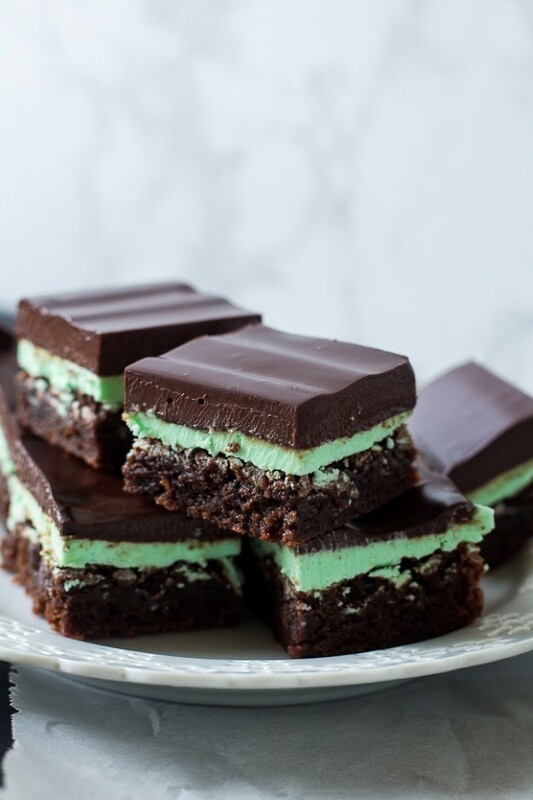 I made your Mint Brownies with Chocolate Ganache yesterday. They were delicious. I was a bit worried about the ganache since I have never made it before but it actually worked. I used the recipe from Natashas Kitchen for the ganache and it couldnt have been easier. (Just needed a bit more directions) Although I must admit yours are prettier than mine. Thanks for the recipe. I will be keeping this one around for good. I’m so glad you loved them, Tami! I’m pretty sure I’ll be dreaming about these!! Where have these been all my life! Thanks for sharing! Delicious. Very rich. The chocolate rolling was a little too much for my taste. If I make them again, I will cut the ganache layer by at least 1/4–using 12 of chocolate and 1 1/2 c. cream. 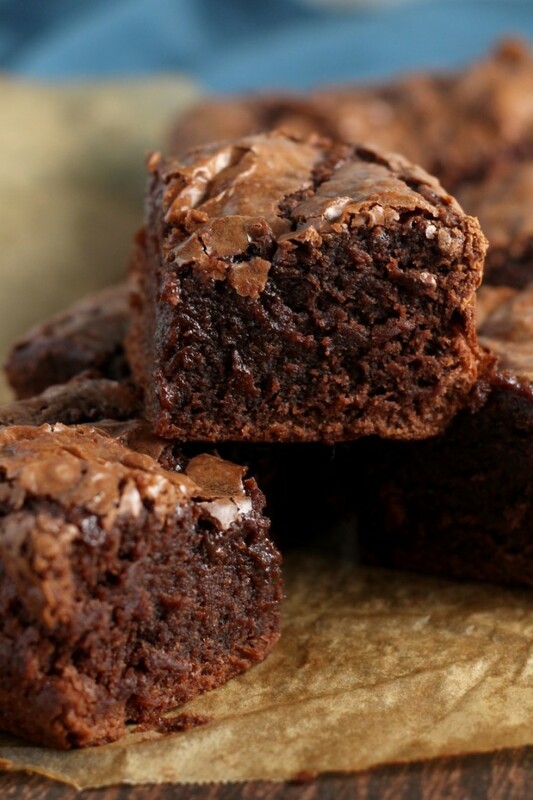 I’m getting ready to make these brownies, as they look wonderfully delicious. I bought one bar of bittersweet chocolate, and now realize it calls for 16 oz. That’s 4 bars of chocolate? That’s a lot (plus, I don’t have enough). Please advise on suggestions. Thank you. I made these yesterday. They were delicious! Although I have to add, this was a TON of ganache. I could have probably cut it to 1/4 the amount! We’ll definitely make them again though. Just made these and there is waaaay too much ganache and not enough buttercream. I made this tecipe as is. I found that the buttercream layer was thin and the ganache layer very thick. Next time I will cut in half. 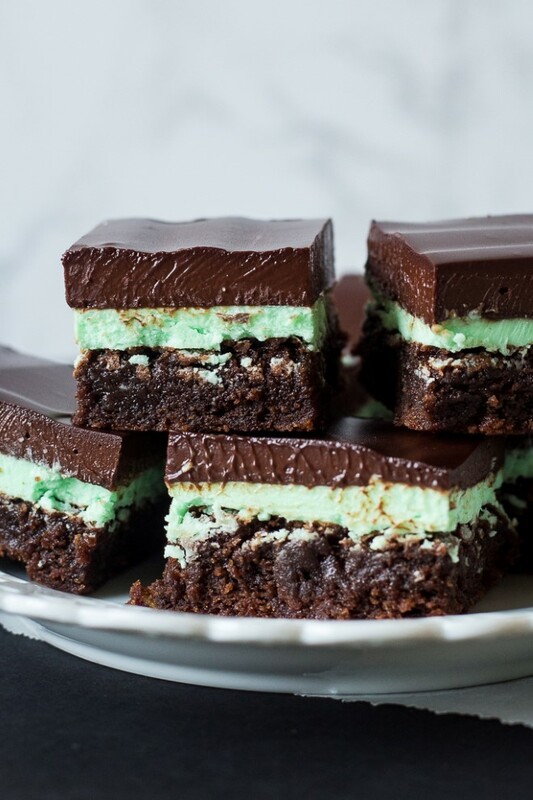 This just made my mint and chocolate loving dreams come true. So so good! Yum, these taste just like my grandpa’s beloved Andes mints! These were amazing! Great recipe! These look DIVINE! Love that chocolate ganache!